Making a strong pitch to end India’s dependence on defence imports, Prime Minister Narendra Modi today promised a conducive environment for manufacturers, including a discrimination-free tax system, and asked foreign firms not to be just “sellers” but “strategic partners”. Inaugurating the 10th ‘Aero India’ show here, the Prime Minister said while the country needs to increase its defence preparedness and modernise its forces due to security challenges that were well known, it should aim to manufacture 70 per cent of military hardware domestically in next five years and remove the tag of being number one importer of defence equipment. 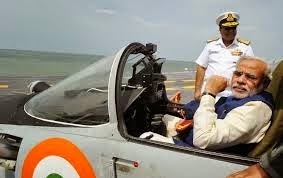 Stressing that developing domestic defence industry “is at the heart of the ‘Make in India’ programme”, he said, “We will build an industry that will have room for everyone – public sector, private sector and foreign firms”. “From sellers, foreign firms must turn into strategic partners. We need their technology, skills, systems integration and manufacturing strength,” he said. He said the foreign players can use India as part of their global supply chain and India’s frugal but sophisticated manufacturing and engineering services sectors can help reduce costs. Also India can be a base for export to third countries, especially because of its growing defence partnerships in Asia and beyond, he said. He said the government was reforming defence procurement policies and procedures. “There would be a clear preference for equipment manufactured in India. Our procurement procedures will ensure simplicity, accountability and speedy decision making,” he said. 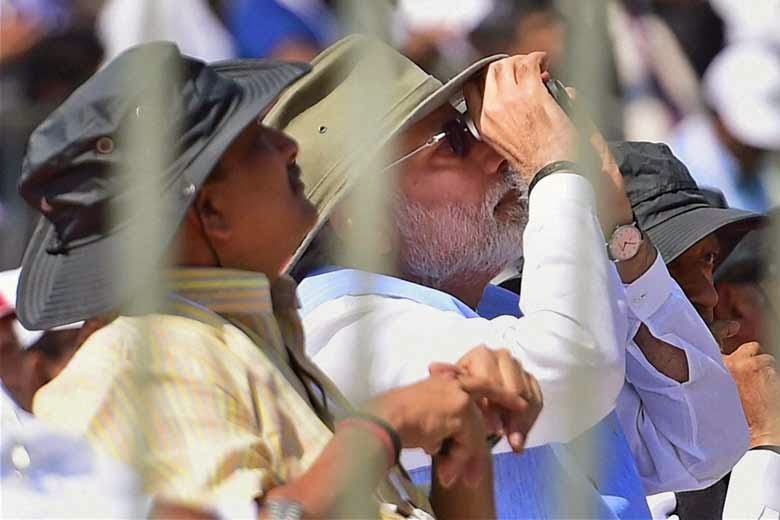 Prime Minister Narendra Modi and Defence Minister Manohar Parrikar watching the flying past display during the inauguration of the Aero India 2015, Asia’s Premier Air Show at Yelhanka Air Base in Bengaluru on Wednesday. “We have permitted investments up to 24 per cent by Foreign Institutional Investments. And, there is no longer a need to have a single Indian investor with at least a 51 per cent stake. Industrial licensing requirements have been eliminated for a number of items. Where it is needed, the process has been simplified,” he said. “We have to equip ourselves for the needs of the future, where technology will play a major role. As a nation of one billion people, we also have huge requirements for managing internal security,” he said. The Prime Minister said that effort is on to expand the role of private sector, even for major platforms. “Our goal is to provide a level playing field for all. We speak in terms of national capacity, not public sector or private sector,” he said.